The Periodic Table: Design & Construction. Drinks Now Pouring. The Periodic Table is open! This is practically old news at this point--it's been over two months already. As usual, construction seemed plodding; it started slower than expected and then there was an unfortunate setback when a contractor ordered (and partially installed) the wrong long-lead-time tile just as things were starting to move. That cost us at least a month. Not a huge deal objectively, but not great for our mental state. We were feeling almost desperate to reverse the cash flow situation, with all the capital outflow this year opening two stores, plus the slower summertime business and the drag of road construction on our business in Public Market. Finally, at the end of August, about a year after starting the project, the construction barricade came down to reveal a stunning little space. Coming in at under 400 square feet, The Periodic Table is a compact operation. Perhaps the most important feature is the pass-through window to Shiba Ramen's kitchen. Being "contiguous" with Shiba Ramen allowed us to use the same alcohol license for both storefronts. The Dept. of Alcoholic Beverage Control ("ABC") told us to build TPT in the next kiosk and "knock a hole in the wall." On one side, Shiba Ramen Corporation does business as Shiba Ramen, and on the other as TPT. We couldn't have done TPT as a standalone bar, because the kinds of alcohol licenses that allow minors to enter the premises (the kind we need in a food court) require a significant percentage of sales to be for food. But to do this bar in such a small space, we couldn't lose any square footage for food prep. We also didn't want to increase our construction and labor costs by investing in another serious food service operation; i.e., we absolutely did not want to build another kitchen (of course, we could have followed the brilliant suggestion of ABC and gotten a "panini machine" or a "soup kettle" to satisfy the food requirement). The whole point was to piggyback on the infrastructure we already had in place, allowing us to focus on alcohol sales and devote as much space as possible to customer seating. Shiba Ramen is "Adjacent Tenant." You can see the pass-through window under the back bar. Every effort was made to pack maximum functionality in the bar area: a back bar cooler for beer kegs with a 12-tap beer tower, a display fridge for bottled beer and sake, a small fridge with worktop for food/drink prep, a dishwasher, and the various sinks needed for code compliance. A hot water heater is stacked on top of a mop sink in a discreet little closet in the back corner. The main bar itself seats 6-7, with another 10-12 seats at the counter that wraps around the room's back and side walls. All the food prep, except for a couple of cold plates, is done in the Shiba kitchen. Above the back bar is a wood lattice shelving unit, where we display bottles and other things. As I discussed on this blog recently, we put a TV in the back of the room. The compact nature of the project created a real challenge for our architecture and food service design team. Not only did they have to make sure all the functional needs could be accommodated, they had to make sure everything was code-compliant, and that the final product looked great. Needless to say, they made it happen, and without too many hiccups. We successfully deflected an uninformed eleventh-hour demand by the city that we install a grease trap in our essentially grease-less space, the inclusion of which would have disrupted the careful balance created over months of back-and-forth among the many stakeholders in the project. In a science fiction world, perhaps we could have fit a grease trap in the extra dimensions contemplated by string theory; in the real world, we were completely out of space. 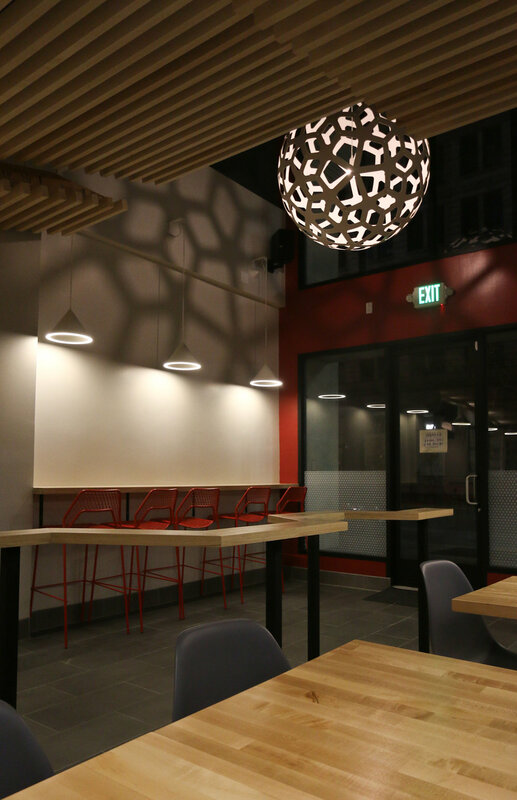 We wanted TPT to be a real standout space, so we hired the folks at Oakland-based Arcsine, who had recently done some excellent restaurant work with Agave Uptown and Calavera. The design process was a low-stress, streamlined collaboration. Arcsine began by interviewing us at some length about the concept and our design goals. 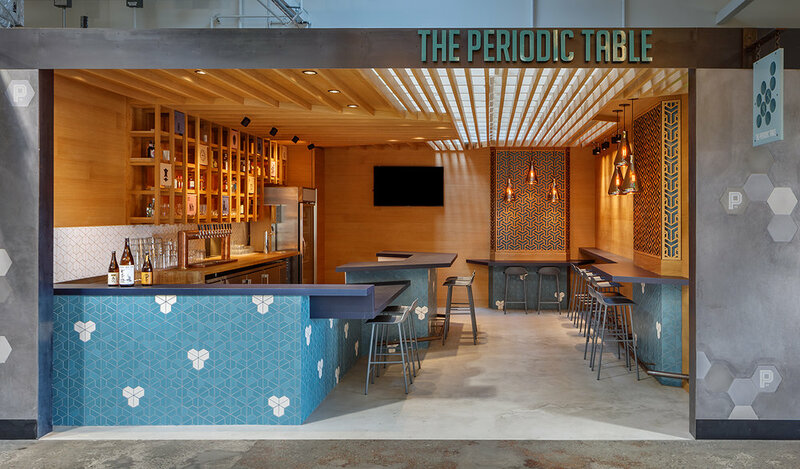 We were looking to build off of the modern Japanese-influenced design used at Shiba Ramen, while incorporating references to chemistry, science, and alcohol. 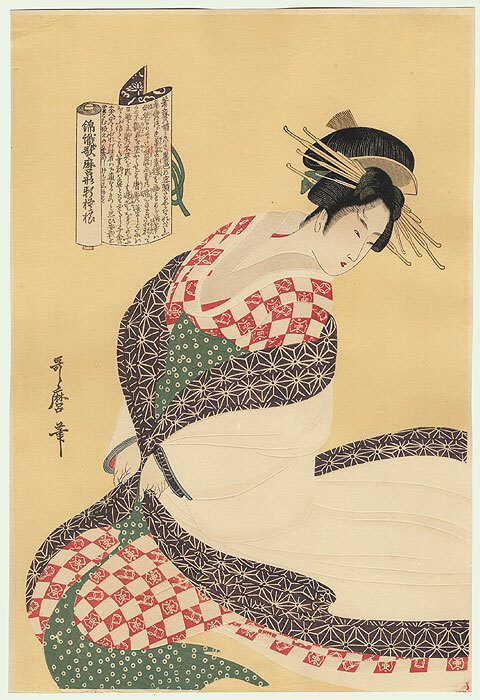 The use of geometric patterns and shapes would allow us to act on each of these goals simultaneously, given the prevalence of geometric motifs in both Japanese design and chemistry. As with Shiba Ramen, we wanted tile and lighting to be feature elements. Arcsine presented us with a set of three concept boards: one emphasized traditional Japanese design, one had a chemistry/industrial theme, and one was more playful with extensive use of color. In response, we suggested combining elements of each theme. We want TPT to present sake outside the usual sushi restaurant context, and we want to steer clear of shoji screens, brushstroke kanji, and the like. 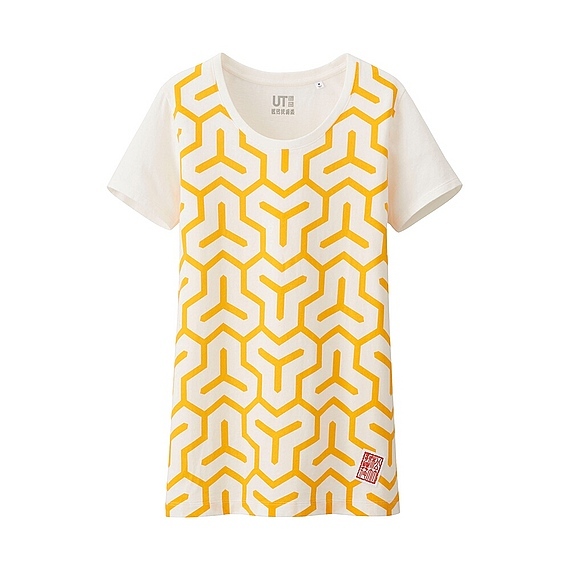 But we were excited to incorporate wood and Japanese geometric patterns. Similarly, we did not want to create the kind of sterile, monotone space that could result if we tried to make TPT into a chemistry lab. We viewed warmth and color as essential attributes of the space. The next time we sat down with Arcsine, they presented us with the refined composite concept slide below. We were totally on board. Over the next few months, we sat down with Arcsine for a series of conversations as they fleshed out the design (the images below include a refined concept collage and an interim material palette). We started with the floor plan, making sure the space had all the necessary technical and code features, arranged efficiently and usefully, all while maximizing customer seating. The main bar terminates with a bump-out in the shape of a half-hexagon, creating an intimate space for conversation, either between patrons or with the bartender. The wraparound bar along the back and side walls contains two more half-hex bump-outs, providing additional focal points for conversation and design features. There are low (34") segments of the main bar and the wraparound bar, both necessary to meet ADA accessibility requirements. The ceiling is closed off above the bar, with a half-hex soffit mirroring the bar bump-out, and oak slats running in parallel from the back bar wall to the front of the bar. The area above the customer area is open, allowing light from the Market's skylight into the space. The oak slats in this area run from front to back, perpendicular to slats behind the bar. The walls are primarily done in oak veneers, with a couple of exceptions. The bump-outs on the wraparound bar feature gorgeous laser-cut oak screens from Lightwave above the bar, in a custom Japanese tortoiseshell pattern. 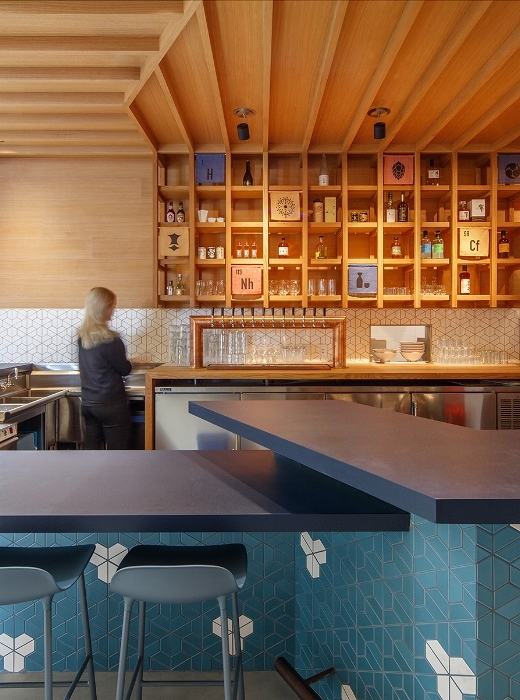 Below the bar, the screens are mirrored by half-hex tiles from Clayhaus, teal blue with white accents, arranged in the same tortoiseshell pattern. The same tortoiseshell tile mosaic runs along the entirety of the main bar die wall, and is used again, although in plain white, as the backsplash behind the bar. The countertops are deep blue, made from a unique paper-polymer composite material called Richlite. The signature copper-coated beer tower has twelve taps. Butcher block is the countertop material on the back bar. The barstools are plastic/steel in a cool muted blue, from Normann-Copenhagen. The space also has two features that are direct inspiration from chemistry. 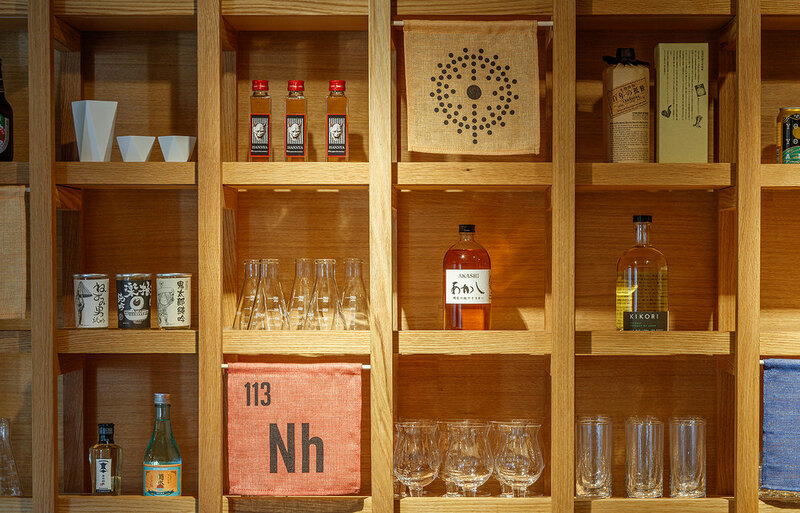 The oak shelving lattice behind the bar is comprised of parallel rows of square openings, suggesting the periodic table of elements itself. The reference is an explicit one, with some of the openings covered in colored fabric squares printed with chemical element symbols (H for hydrogen, O for oxygen, Cf for Californium, Nh for Nihonium), a graphic representation of the platinum atom, and our ethanol-molecule logo, among other things. In front of both laser-cut screens are sets of pendant lamps shaped like Erlenmeyer flasks. The lamp is appropriately called "the Erlen," so its designers clearly had chemistry in mind when they developed the product. Side note: this was the one piece of the design Hiroko and I took direct responsibility for, exhaustively scouring the Internet for chemistry-themed lighting. 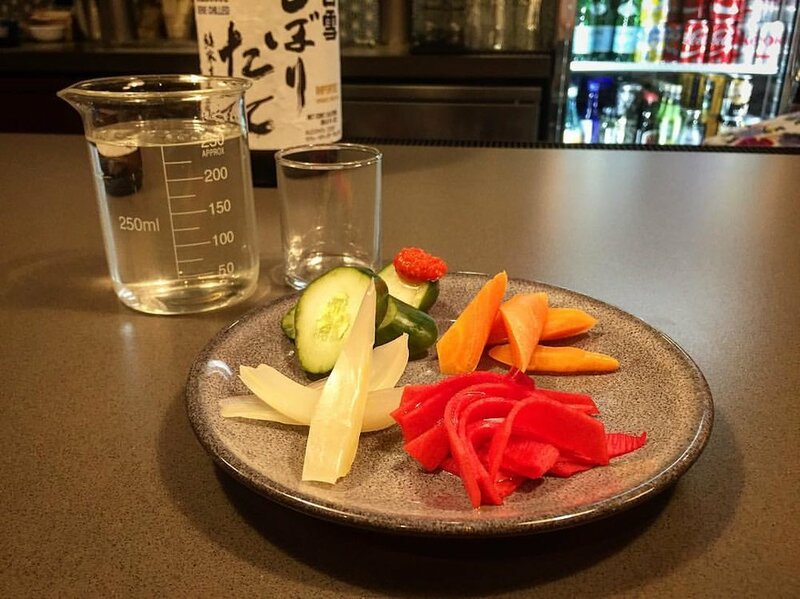 Today we are serving sake by the glass in actual Erlenmeyer flasks. So the space is pretty amazing. Arcsine came up with a striking design, which UpCycle Builders executed beautifully. The finishes and the carpentry are exemplary (and so are the drinks, by the way). I love spending time there, and I hope other people do too. It would be pretty sad if I didn't, though, because--brace yourself--this little room cost about $350,000 to design and build, financed through a combination of a Small Business Administration loan, cash, and landlord tenant improvement funds. Then add $40,000 for equipment. Total capital investment close to $400K. That's the cost of doing a tiny designer bar space in the Bay Area. The shock of these costs has worn off to a degree after three projects, but it still seems kind of appalling. There are still a few improvements to be made before the space is really complete, but we'll get to them when we get to them. We're working on some graphic educational collateral about our products for the wall, and we need a better sound system. We obviously need to sell a lot of booze, so if you're reading this please come and drink ASAP, and bring some friends! The burger is great, and you can eat ramen and wings at the bar. Here's where we are with the drink menu: 20-25 sakes, 10 draft beers, bottled Japanese beer and California ciders, a growing selection of Japanese spirits, including whisky, shochu, gin, and vodka, and a small cocktail menu. The food menu is minimalist at present, but likely to grow soon. We have cheese, charcuterie, and house-made pickle plates, all great drinking foods. Sports are on the television. See you there. Sleek blade sign fabricated by Sweitzer Fixtures and designed by Misa Grannis. Shiba Ramen Oakland is starting to come together fast. Most of the dirty work is winding up, and finish materials are starting to go in, with equipment to arrive next month. See what we started with, what materials we've chosen, and how we're putting them together to create a great downtown dining and drinking space. I just flipped our shiba inu calendars to August. Aside 1: How is it August?? Aside 2: Yes, plural. Our love of the shiba is sufficiently well-known that we received two shiba calendars as gifts this year. There's more than one wall here at HQ, after all. But, to my point, it is now August. This is the month Shiba Ramen construction should begin! Our building permits have been issued, and we're seemingly days away from hiring a general contractor. Aside 3: I've said "days away!!" every week for the past month, but getting these contractor bids resolved is an almost unbearably slow process. But this time I really mean it. Maybe. Shiba Ramen. More or less. We've had to cut the bar seating due to obscure regulatory requirements. The storefront elevation diagram below shows the change. This image does not reflect what the tile will actually look like. For a more accurate view, see the image below. The point, dear readers, is that we have something to build and we're ready to build it. We have a space design that we're really excited about, and that's just a part of the exceedingly complex architectural plans for the whole operation. Seeing how much goes into a sub-400 square foot restaurant space is eye-opening, to say the least. Over the past few posts, I've explained our approach to space design, from the aesthetic we're trying to create to the many external forces that shaped our decision-making. This time, I'd like to show you where we ended up, and give you a preview of what Shiba Ramen will look like. With any luck, I'll be posting pictures of the real thing in a couple of months. Storefront Elevation Diagram. Everything to scale. Here you can see that the bar seating has given way to a standing area. So here's how we struck a balance between our design goals and the competing constraints on design freedom. 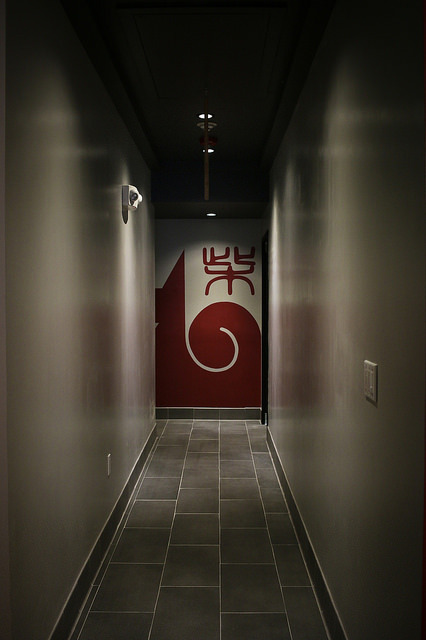 We chose to focus on four elements: color, tile, wood, and lighting. The first element--color--was an easy one. Shiba Ramen's signature color is a crimson red, so it is critical that that color is prominently featured in our first location. The storefront sign above our kiosk, a backlit strip of water-jet cut aluminum, seemed like the ideal (and most appropriate) place to deploy the Shiba red. But we wanted the red to play more of an accent role on an overall basis, rather than a dominant one. So we decided to feature it on the edges of our visible shelving and menu board strips. Our pendant lamps are orange-red, not an exact match with the Shiba red. What can you do. To accompany the red motif, we decided to incorporate a blue in our tile. Although the hoshi tile comes in "clay" (sort of a brick color), which may well have worked with the red theme, we thought a cool blue would look great as a backdrop for the red. It provides a nice contrast, and because we love blue, we wanted to find a way to incorporate it into the design. For the tile, the hardest part was finding a place to put it. Because we have to use the landlord's blackened steel panels under-counter, a different location was necessary. We solved this problem by incorporating a customer-facing drop ceiling behind the point of sale. The hoshi tile will be done as a blue-to-white gradient from the left side. We will use a small amount of gray tile to help intermediate the transition. The menu board will hang over the right side of the drop ceiling, directly behind the register. Wood Elements. Blade sign (left) and mock-up of menu board (right). Prices not to scale. We are using wood in a couple of ways. First, we'll use a set of engraved plywood strips for the menu board, with the edges painted Shiba red. We'll also use plywood for the blade sign, engraved with the Shiba Ramen logo. But the big wood element is the slatted pine soffit that hangs above the counter and extends down the wall alongside the point of sale. The soffit is comprised of a series of adjacent triangular segments, with the wood in each oriented perpendicular to that in the next. On top of that, the surface is three-dimensional, so that the triangles will undulate along the length of the space. Where the soffit runs down the wall, we will overlay a stenciled asanoha pattern to tie the tile motif into the wood element. Our view is that the angular and geometric nature of the wood soffit will tie in nicely with the similarly angular asanoha tile. Soffit. This behind-the-counter view shows the three-dimensional nature of the pine soffit. For the over-counter lighting, we are using a set of four pendant lamps. These so-called "chouchin" lamps are made by an Italian company, Foscarini. But they are inspired by Japanese design. Chouchin are traditional Japanese paper and bamboo lanterns. You've certainly seen them before. The Foscarini lamps are sleek blown glass renderings of this historic lighting element. In other words, it's the exact kind of thing we want to showcase at Shiba Ramen. Lights! Foscarini's "Chouchin" collection at left. We're using the smaller orange pendant. Japanese chouchin lamps at right. Note: all of the fantastic images above were produced by our design partner, Misa Grannis. We worked closely with her throughout the process of putting this together. She did the heavy lifting and put together a great design package that we were proud to stand behind. Hiroko and I contributed mostly be musing, opining, and trying not to be annoying.